Though it comes with the name of 'Summer', it truly fits every season of the year with its adaptable colors. Handcrafted and one-of-a-kind, every detail justifies the beauty of this thoughtful piece of art. Love this gold, almost collar-like necklace. All the right attention is called to this understated piece that flatters the natural lines it lays against. Because who isn't intrigued by the opaque orb held by separated prongs that hang from the chunky chain? This could easily become a favorite accessory. 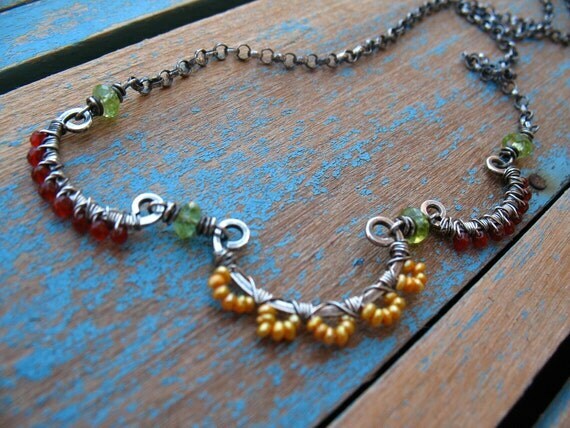 Sterling silver, gold, and coral collaborate nicely into this beautiful, fun necklace. Fall appropriate, indeed! -especially finished with the feather. Boho chic at its best. What are your favorite FALL necklace trends? Is there a special style you are craving or are there too many to possibly narrow down?